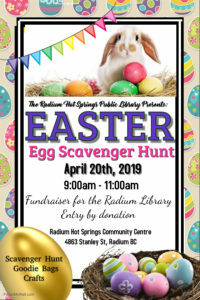 The Radium Library will be hosting an Easter Egg Scavenger Hunt on April.20th from 9:00am-11:00am. In addition to an Easter Egg Scavenger Hunt, there will be crafts, colouring and goodie bags. The Easter Bunny will even be making a special appearance! Entry is by donation and proceeds of this event will go towards future children’s programs at the Library.